"Fresh out of the skillet, these buckwheat pancakes go great with homemade sausage. This is a forgiving recipe, and each kitchen and cook seems to add a personality to the pancakes. Follow the general process, and after you have learned that, have fun!" Combine buckwheat and all-purpose flour in a mixing bowl. Add buttermilk and yeast. Stir with a spoon until batter is smooth. Add more buttermilk, 1 tablespoon at a time, if batter is too stiff. Cover bowl with a dinner plate and let stand in a draft-free place, 8 hours to overnight. Add sugar, baking soda, and salt after the overnight rest. Mix in enough hot water to give batter a thin, pourable consistency. Heat a lightly oiled griddle over medium heat. Drop batter by large spoonfuls onto the griddle and cook until bubbles form and the edges are dry, 3 to 4 minutes. Flip and cook until browned on the other side, 2 to 3 minutes. Reserve some batter as a starter for the next batch. 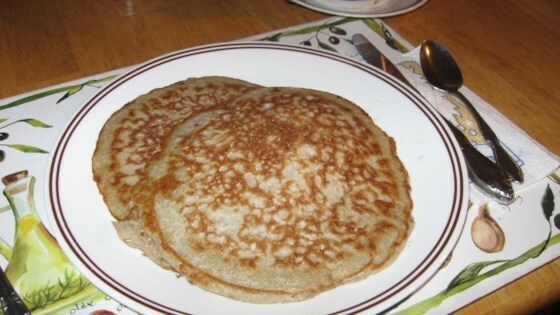 After making desired number of pancakes, add enough buckwheat flour and buttermilk to make a batter. Cover and let stand in a draft-free place until more pancakes are to be made. Repeat steps 3 and 4 for each batch of pancakes, then make more batter each time following this step. Batter may be kept at room temperature and used repeatedly for 3 weeks. If any batter is left after 3 weeks, discard it. Substitute 1 1/2 packets active dry yeast in 1 cup warm water if preferred. Just like my mother used to make. Well worth the overnight process. I cut the recipe in half and still had enough for two days.